THE DOCTIOR IS IN AND HIS NAME IS DR. FEICKERT! THIS FIREBIRD IS NOT MADE BY DR. FEICKERT, BUT IT’S VERY COOL!! Taking the time to develop everything new from scratch Dr. Feickert finally ended up with a nicely compact and elegant new turntable. This new design has all virtues the German brand is famous for - perfect neutrality, elegance in appearance and build quality, to name only a few. All the core components used in the bigger model lines underwent an evaluation if they suit the new design approach. It turned out that all of them had to undergo a complete redesign. Testing and refining recursively ended up in this new design that will be a benchmark not only in its price-range of products. As the universal sliding armboard mechanism could not be transferred to the Volare still there is an easy way to swap to other tonearms almost on-the-fly at low cost in short time. The new chassis topology is focused on high mass in the center of the bearing. This new bearing is extremely stiff and robust as well as being a low friction design. High inner inertia and an oil bath wet sump approach make this bearing a perfect partner to the high-torque motor design resulting in low rumble and smooth operation. … was obvious. The design of the smaller brother has a special appeal to build a turntable a little bigger in size. 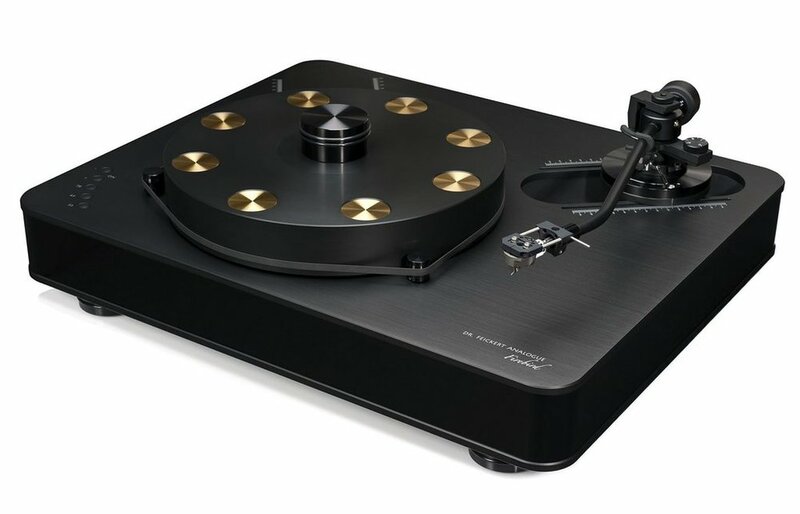 There are lots of vinyl lovers who wish to run two tonearms on one deck - here we go! We did not only make a simple upscale but set a new course in terms of ease of use. … was to enhance the technical base of the Woodpecker to push forward the sound quality. Running two tonearms was a requirement but we also implemented some new ideas on the drive. We refined the controller software to drive two motors simultaneously in a kind of master-slave configuration. Putting the two motors in a 180° position around the bearing cancels out all reactive forces that could cause gyration of the platter. As a free add-on we achieve a better randomization of wow & flutter less disturbing the hearing process and lower bearing rumble at the same time. … is an enhanced sovereignty in sound - excellent measurements and a timeless elegance combined with absolute ease of use. As a world‘s first we have integrated a dedicated Protractor that is blindingly simple in use. You will be amazed how easy setup of your cartridge can be. … sovereign, dynamic, powerful and neutral at the same time. No matter which tonearm you are planning to use. Relax and take a trip into the fascination of music knowing that not even the smallest detail on the black gold is being kept back. Forget about technical details, enjoy the music in all its grace! … was built out of customers‘ enquiries. Most peoples‘ association of a turntable is a wooden box, platter and tonearm - that‘s it. And here we go: Have a look at our idea of such a design. With the very high level of performance already given from the older models the only difference should be the appearance. … is a new design on its own - timeless elegance meets excellent sound. Refining our well-proven bearing design, platter and high torque motor, we bettered the virtues of our old models in a compact chassis. Needless to say that motor electronics was newly developped from scratch to match this new approach in a perfect way. … will leave you stunned – no matter which tonearm you are planning to use (the sliding-base allows you to mount nearly all available tonearms from 9 up to 12 inches). Relax, listen to pure music and forget about the technology behind. GET MORE INfO ON THE DOCTOR OF TUNRTABLES! MORE TO COME, HANG TIGHT!